The covers fit the stool well and are thick enough for comfort. I used this on my kitchen stool. It added some needed padding to a hard stool. I like to sit while I'm preparing dinner, and this makes a big difference in comfort. These cushions are very comfortable, being that there are thick. Have no qualms with them. 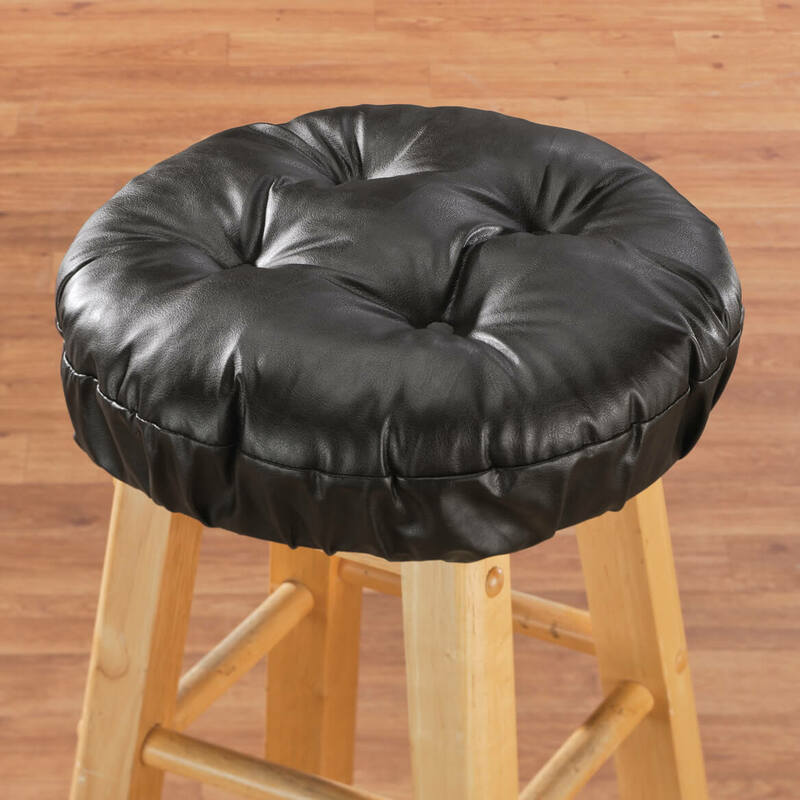 have been searching for awhile to find a barstool cushion such as this! glad I found it. Very nice looking in my kitchen and very comfortable to use. Good buy! I Would be buying this product again. THE bar stool cushion that I purchase is great and they are very sturdy my kitchen look neat. They fit our stools just perfect. Yes yes, I would buy this product again and again. I love the fabric, perfect fit, true color, the cushion provides comfort for seating. Easy cleaning. Price not too bad. I always get compliments. I will order again. Sure wish you had red. Use on bar stools in kitchen at breakfast nook. Black was a very difficult color to find, our kitchen is black and white, so am very happy with these. I have ordered extras in case one gets damaged or worn out. Love My Bar Stool Cushions! Padding is thick. Cover seems thin; not sure how it will wear. 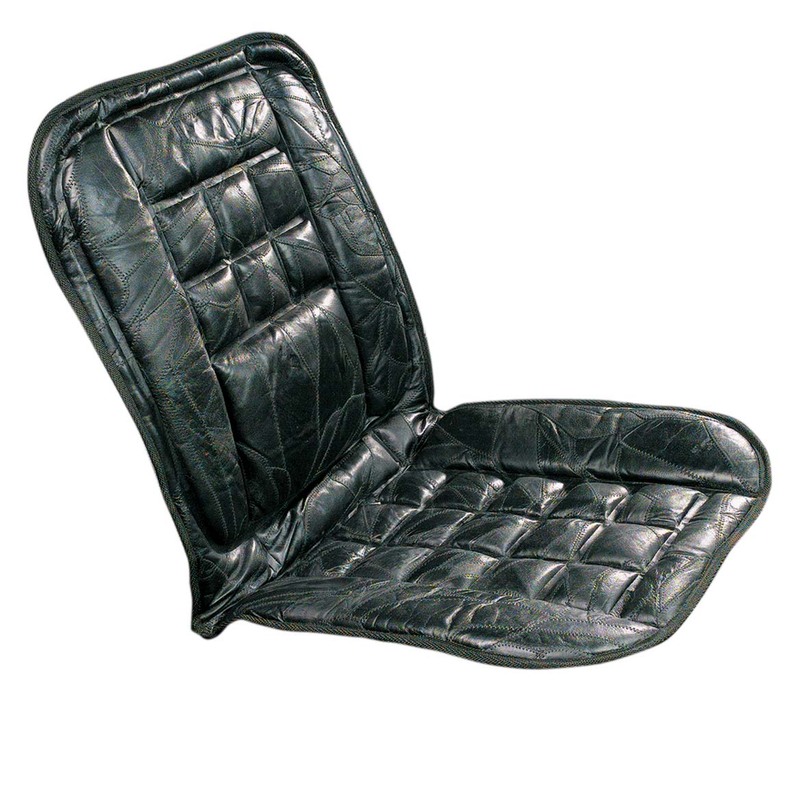 This item has poor elastic it stretch out with in months without much use and makes the seat cover move and distort on the seat I am having to replace and cannot return it. will not recommend it to anyone. !!!!!! I was very disappointed in the bar cushions. On one cushion half had no padding and the other one looked like it had been cut with a knife. I should have returned them but I was so upset I threw them in the trash. I certainly will think twice before making another purchase. These are a great buy, they are really nice. Wooden stools at the breakfast bar are not very comfy, but they are all that will fit my space. These cushions had good reviews, so I am anxious to try them. I am matching 2 I already have. because it is 4 inches thick. The ones I bought before is wearing out and I need to replace them but I have been very happy with them. this item appears to be a quality item and it exactly what I need to cover my bar stools. I needed cushions and these looked good. 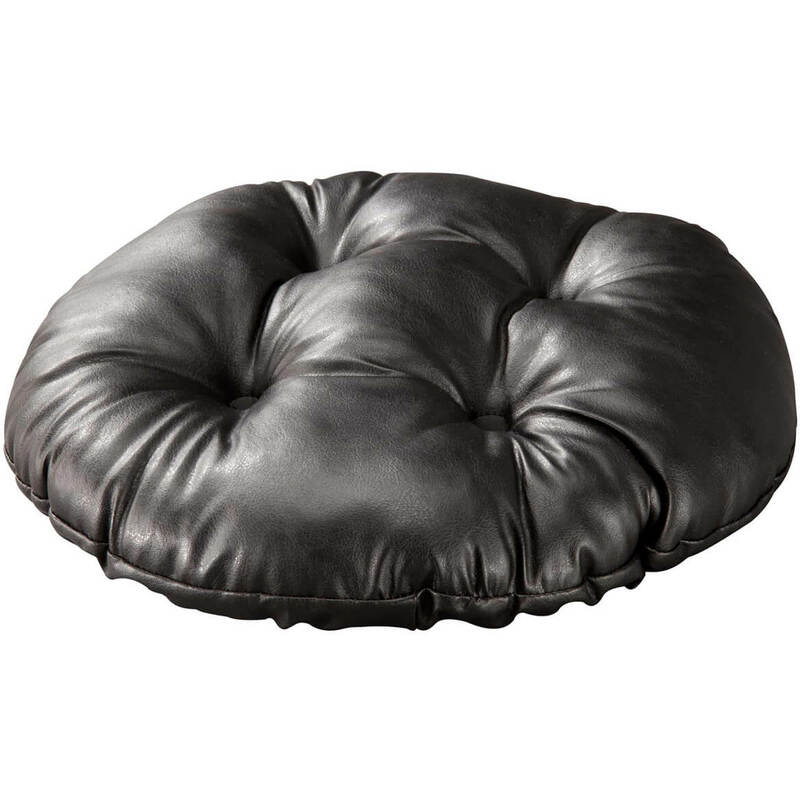 I have black leather furniture and think these would look nice over my stools by the counter. Good match for marble countertops. Hard to find 13" covers with elastic. My stools were getting scratched on the top. Also needed just a pinch more height. 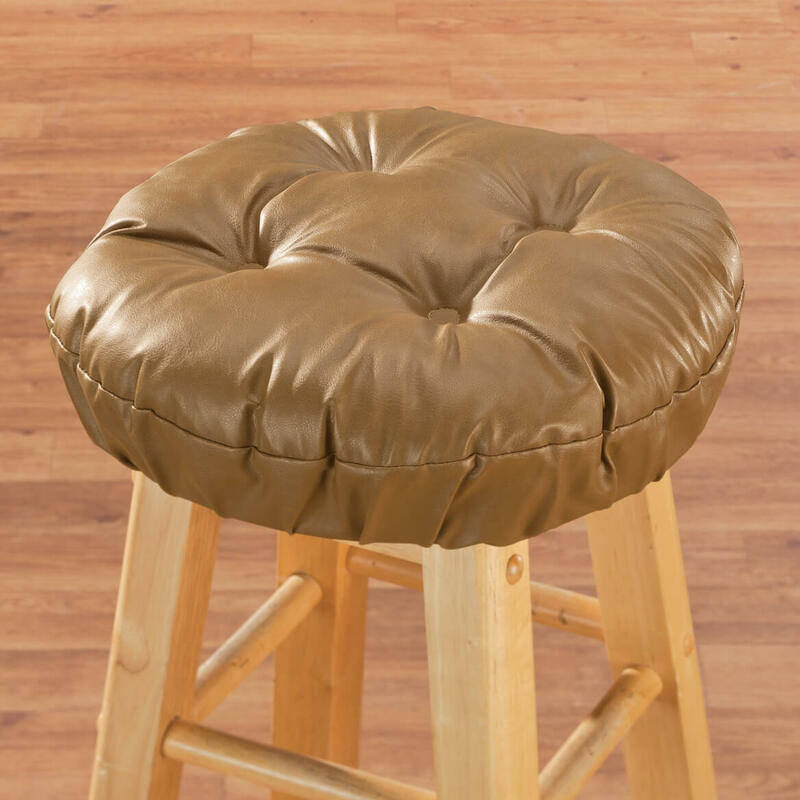 These are the first 'faux leather' bar stool covers that appear to be the thickness I am wanting. I like the full cushion look hope they are standard size to fit my bar stools. 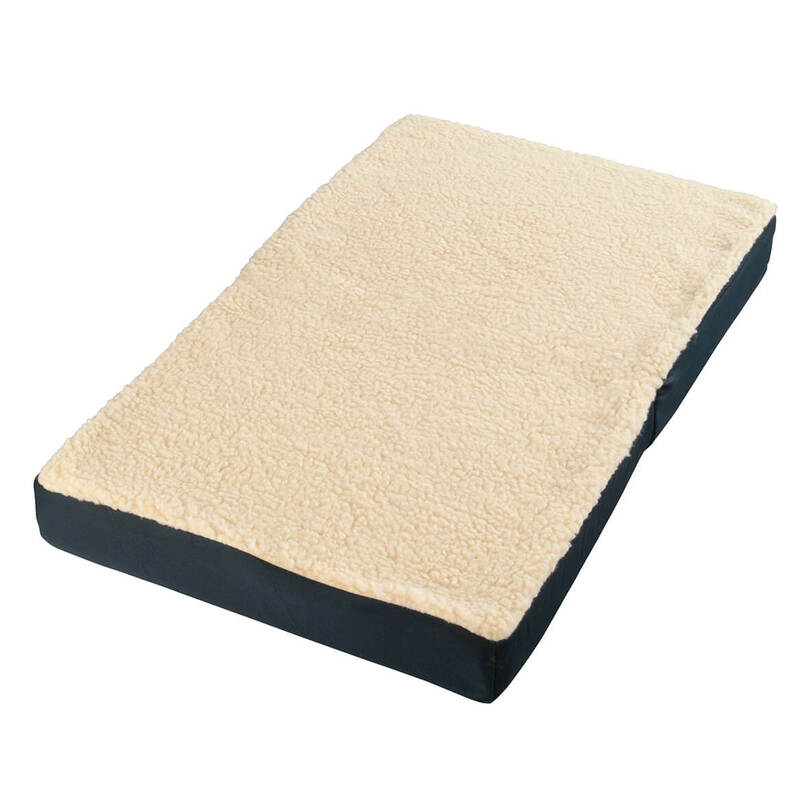 The elastic cushions will work on the wooden stools we already have. 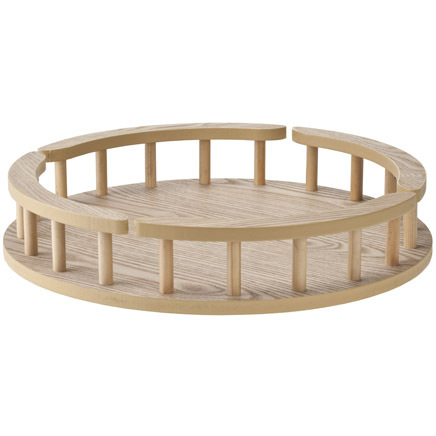 I need this to soften my stool seat. I have a perfectly good wooden stool, but the cushion is beyond repair. I didn't want to just throw it away. This way, it will be like a brand new stool. Need a replacement cushion. Current one is old. Updating my kitchen, this will go perfectly! My other cushions are old & stained just cotton..Need to be replaced. These can be wiped off easily. I want to dress-up my bar stools. can these go on without the elastic the chair has a back on it? 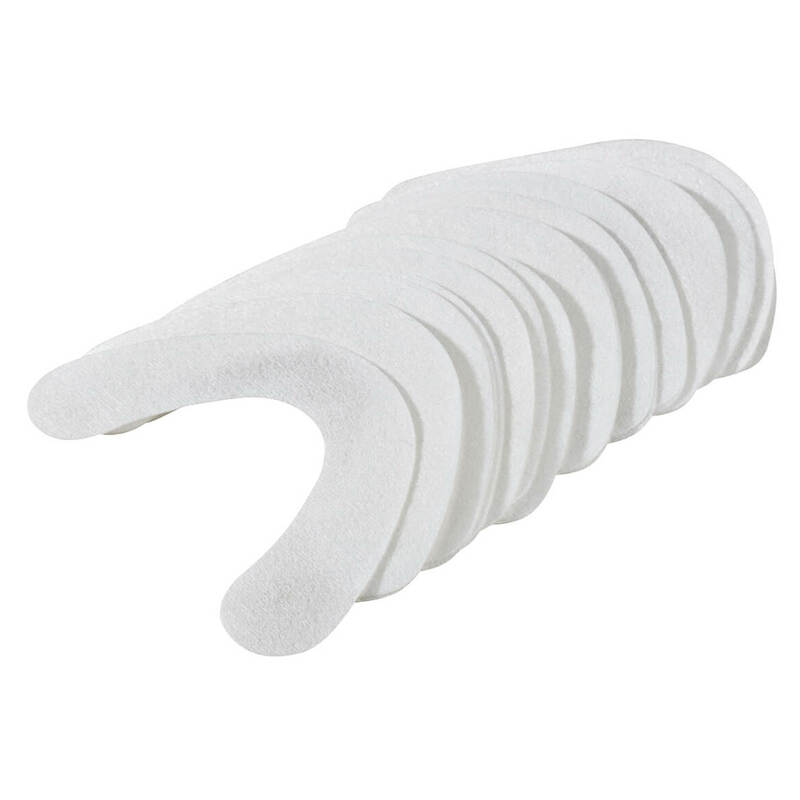 BEST ANSWER: Yes, these will work without using elastic if you do not worry about having them secured in place. They look very nice however the tufts are glued rather than having buttons and have come unglued on one cushion of the four that we purchased. Hope this is useful--Ellen A. We used ours on a stool without a back. 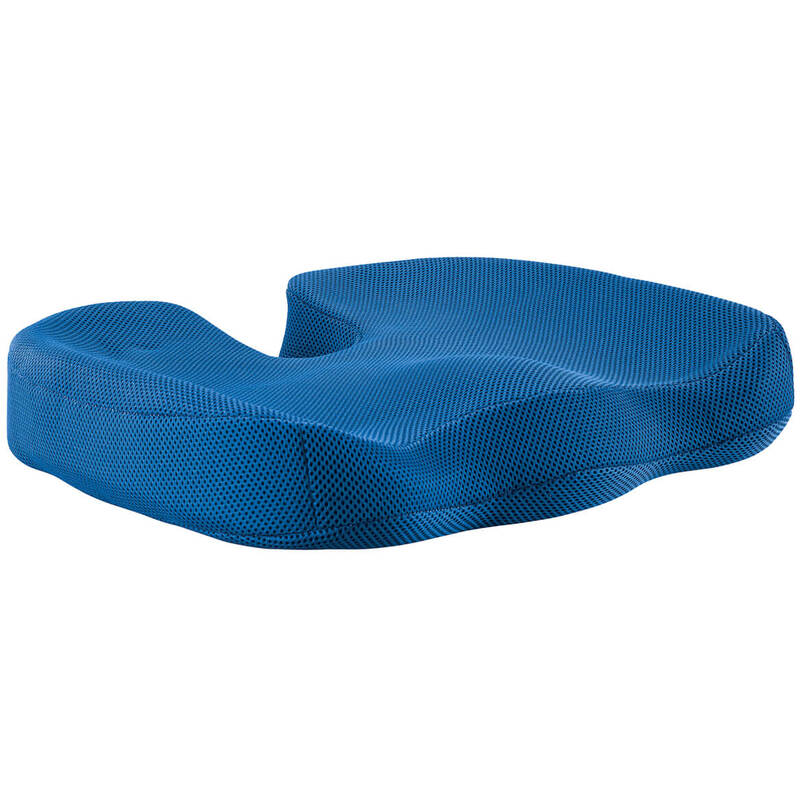 You need the elastic to hold the cushion on securely. I suppose it could be stapled on from the underside if you removed the elastic. I'm not sure about that though. It all depends if the seat portion is attached to the seat portion. BEST ANSWER: Thank you for your question. 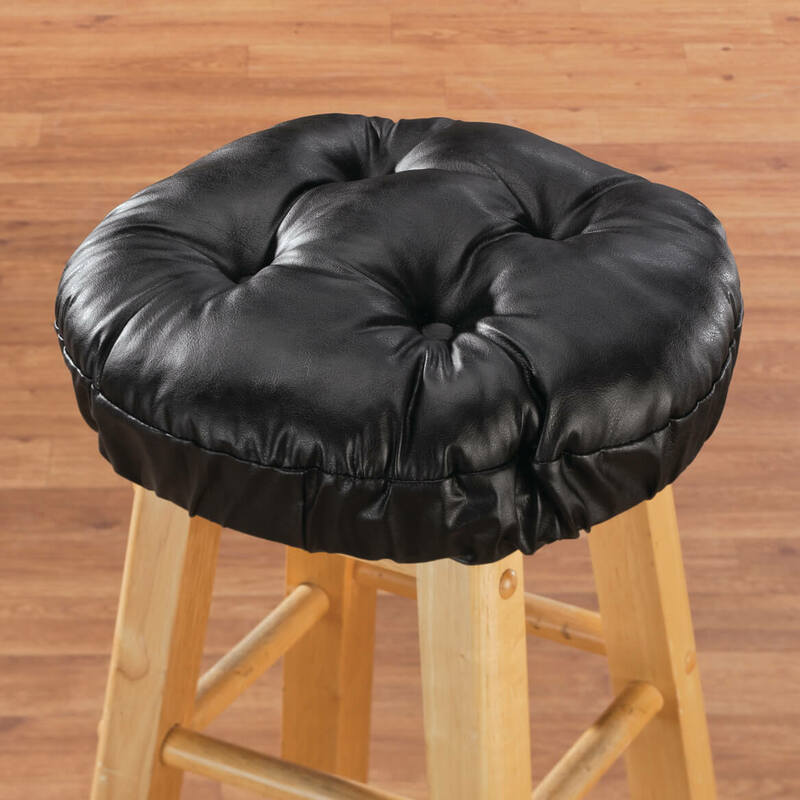 The Faux Leather Tufted Bar Stool Cushion has a 13" diameter. We hope this information will be of help to you. My stools are cushioned, do u have covers that do not have a cushion? BEST ANSWER: Thank you for your question. Unfortunately we do not carry any cushions that do not have cushions. We hope this information will be of help to you. Do you have 15" ? BEST ANSWER: Thank you for your question. Unfortunately we do not have a 15" diameter cushion. We hope this information will be of help to you.